Wednesday was a big day for goggles in my life: I spent the afternoon at Harvard University's Innovation Labs, where hundreds of people tried on the latest virtual and augmented reality headsets, then I watched the Boston Red Sox on TV that night as they donned ski goggles meant to keep champagne from spraying into their eyes as they awkwardly celebrated winning the American League East title despite blowing a game to the Yankees in the bottom of the 9th inning. Coincidentally, the Red Sox baseball team was among the exhibitors showing off their virtual reality application, which enables fans to step into the batting cage to get a feel for what it's like to be up close to David Ortiz while he's hitting or David Price while he's pitching. The Sox offer their Samsung Gear VR experience both at Fenway Park and at community events, such as this Hubweek event that took place at Harvard Innovation Lab. One clear message at the event, though, was that this technology capable of creating the most delicious of eye candy isn't just for fun and games. 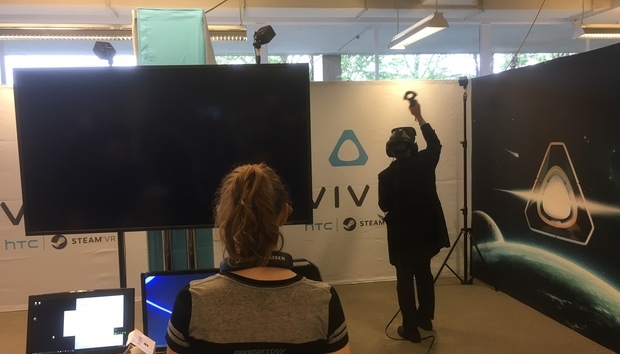 The iLab event attracted a diverse crowd, including students, investors, professional techies, and among others, a Boston public school math teacher who said he took the day off to learn about AR and VR. The message about all of this technology's possibilities was hammered home via a keynote remote chat with Rony Abovitz, the head of buzzy mixed reality lightfield company Magic Leap, panel sessions addressing the use of AR & VR in vertical markets such as healthcare and education, and a demo area boasting a couple dozen exhibitors. Yes, the exhibits included a handful of fun apps, including HTC Vive's Steam-powered VR technology, which I took for a spin, cavorting with whales in an underwater adventure and drawing sparkly and colorful lines across a star-filled sky, all while wearing goggles, a headset and finagling controllers in both hands. But other apps got down to business. Wayfair Next Director Mike Festa got hands on with attendees who rearranged deck chairs and other furniture in a virtual way. Strivr had attendees crouching and swinging wildly as they attempted to hone their athletic skills. Bounce Imaging drew a crowd to its ball-shaped 360-degree cameras for enabling first responders to explore crawl spaces and other possibly dangerous without necessarily putting themselves in harm's way. A couple hundred people packed a classroom to hear panelists discuss the latest in AR/VR in health and medicine, with talk of using the Oculus Rift and Microsoft HoloLens to aid in treatment, and using AR/VR and mixed reality technology for remote care and interacting with autonomous systems. MIT Lincoln Lab reps discussed the immersive Computer Assisted Rehabilitation Environment (CAREN) within its new STRIVE Center that can be used for clinical work, training for first responders and more. Lincoln Labs' Jeffrey Palmer said big challenges remain in making AR/VR systems more adaptable and more in-tune with individuals, who might react to immersive experiences in different ways. During the event's kickoff chat with Magic Leap's Abovitz, who appeared via a Beam robot screen, he was asked about possible business uses for his well-heeled startup's yet-to-be-revealed technology, which he said stemmed from "trying to imagine a creative future state of how computing should be." In general, he says AR/VR/MR have potential to improve all sorts of workers' lives in that our brains have evolved to be spatial, yet much of what's required to do certain jobs now involves making a leap from abstract to spatial that some people just can't handle. This could impact jobs in architecture, education, medicine and others, he says. "We're making technology bend to our neurology," Abovitz said.